If you've paid attention to the synthetic tests from the previous pages, the results here should make sense. 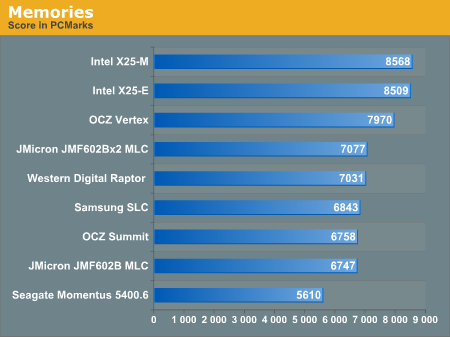 The Intel drives take the top two spots followed by the two OCZ drives, then the JMicron and conventional HDDs take up the rear. 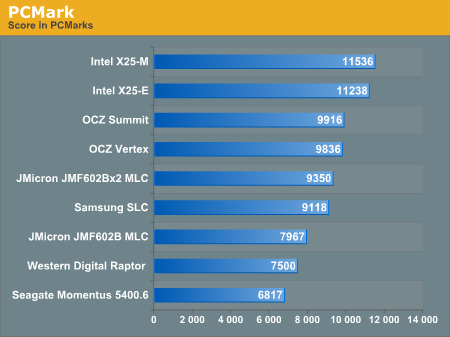 While PCMark does do a great job of measuring disk performance, it doesn't seem to stress random write performance as much, allowing the JMicron drives to relax a bit. The memories suite includes a test involving importing pictures into Windows Photo Gallery and editing them, a fairly benign task that easily falls into the category of being very influenced by disk performance. 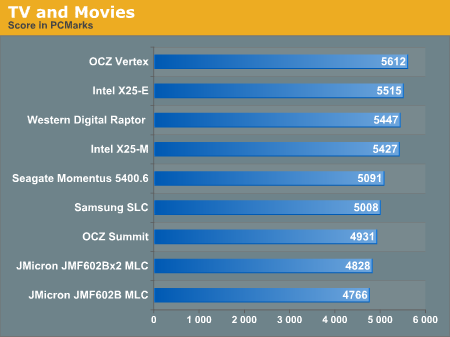 The TV and Movies tests focus on on video transcoding which is mostly CPU bound, but one of the tests involves Windows Media Center which tends to be disk bound. 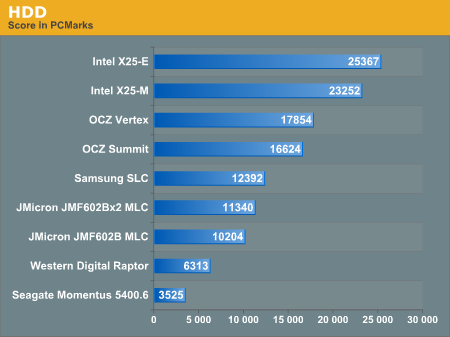 SSDs won't always dominate and in many cases they won't offer tangible improvements over a fast hard drive. The gaming tests are very well suited to SSDs since they spend a good portion of their time focusing on reading textures and loading level data. All of the SSDs dominate here, but as you'll see later on in my gaming tests the benefits of an SSD really vary depending on the game. Take these results as a best case scenario of what can happen, not the norm. In the Music suite the main test is a multitasking scenario: the test simulates surfing the web in IE7, transcoding an audio file and adding music to Windows Media Player (the most disk intensive portion of the test). The Communications suite is made up of two tests, both involving light multitasking. The first test simulates data encryption/decryption while running message rules in Windows Mail. The second test simulates web surfing (including opening/closing tabs) in IE7, data decryption and running Windows Defender. I love PCMark's Productivity test; in this test there are four tasks going on at once, searching through Windows contacts, searching through Windows Mail, browsing multiple webpages in IE7 and loading applications. This is as real world of a scenario as you get and it happens to be representative of one of the most frustrating HDD usage models - trying to do multiple things at once. There's nothing more annoying than trying to launch a simple application while you're doing other things in the background and have the load take seemingly forever. The results here are the best characterization of my personal experience with the drives. 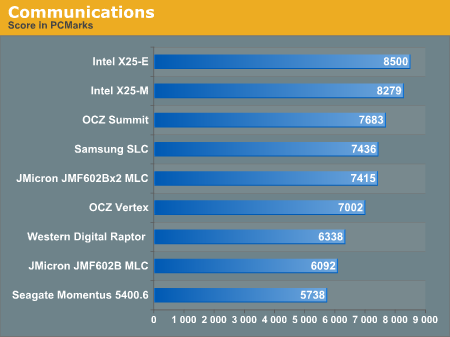 The Intel drives are the fastest, a good 25% faster than the Summit or Vertex. 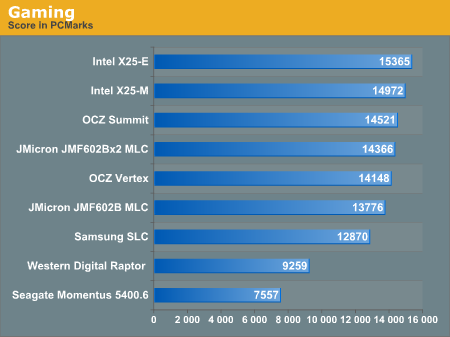 Next up are the OCZ drives, with the Vertex dangerously close to the Summit. 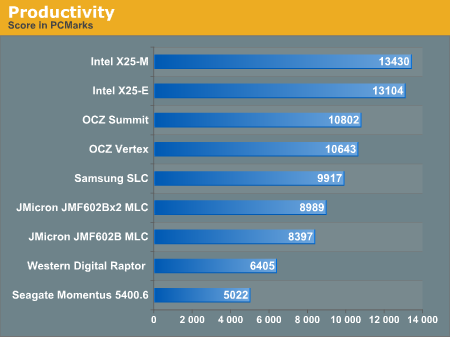 The older Samsung SLC is next in the standings, followed by the JMicron drives. There's a healthy combination of reads and writes going on here which benefits all of the SSDs, including the less desirable ones. Again we're seeing the sort of breakdown we'd expect. 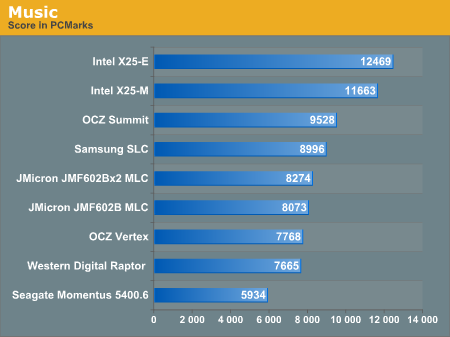 The Intel drives come out ahead, while the Vertex is the best bang for your buck.